For those of you who don’t know, EGX Rezzed is the more indie game focussed version of the EGX game show in the UK. It gets coupled with the BAFTA Games Awards which take place the evening of the first day as part of a bunch of events called “Games London”. I spent some time at the bigger sights Rezzed had to offer doing some red carpet chats with John Carmack and David Braben as well as talking to Creative Assembly about Total War: Warhammer which is coming soon, but now we get to the meat of Rezzed and for this article, I had a play around on Sigma Theory and a chat with the developer from Mi-Clos Studio (makers of Out There) about the game. 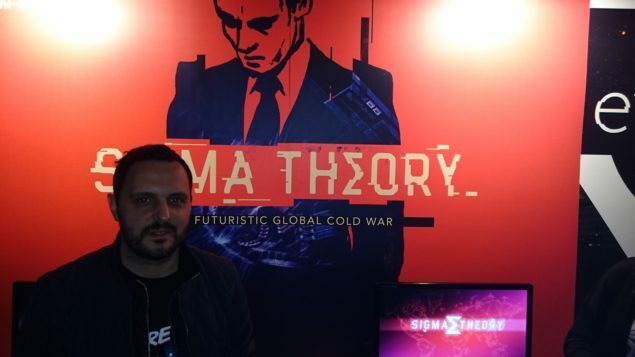 Sigma Theory is a kind of turn based… espionage game? I say that because it’s a bit of a mix. I’m definitely not being negative about it because I actually really enjoyed the time I spent playing it but it’s a combination of different things which in the same way that the original X-Com in the 90’s defied description, this does too. The basic premise is that some scientific breakthrough is imminent and will change the world, for good or ill depending on who gets their hands on it first. You represent a country whose government has told you to reach the prize and unlock the Sigma Theory by any means necessary before anyone else. The global view with agent “Anne Berners-Lee”! You do this by sending your agents to other countries and investigating them. Agents have different attributes like intelligence and strength as well as where they’re originally from which make them better suited to certain missions and locations. You also have to worry about diplomacy with the other countries so if they catch your agents on their turf or trying to kidnap their scientists, there’s going to be trouble! So you send your agents around, convert or kidnap other nations scientists, force them to work for you to help you develop your tech tree and reach the ultimate prize of unlocking the Sigma Theory. At the same time as your global view, you can also have “Encounters” when you have an agent in another country where their forces get onto you. At this point, you then take over the action in some kind of top down turn based city view to try to escape with your scientist prize. Agents can be injured as well if you try to fight rather than escape. When you’ve identified a target scientist, you can check out their attributes too so that helps with identifying the best approach you can take to try to get them over to your side. This can include seduction, kidnap, conversion etc. All in all, the game looked great. It’s not particularly near completion and the devs have quite a bit of stuff in the game which is placeholder, but you can see where they’re going with it and it looks quite promising to me and the parts of the game I played (sending agents around, kidnapping scientists, escaping from encounters) all looked good and the game was stable. The diplomacy readings were in the game but placeholder for the time being. I sat down with Michael Peiffert to chat about the game at Rezzed. W: Hi Michael, thanks for showing me Sigma Theory! How is it going so far? M: Well we’ve been working on the game for almost two years now, we started production last summer and the aim is to launch next year. It’s quite an ambitious game with a lot of experimental stuff that we’re testing internally at the moment combining it between a game of chess and an adventure. 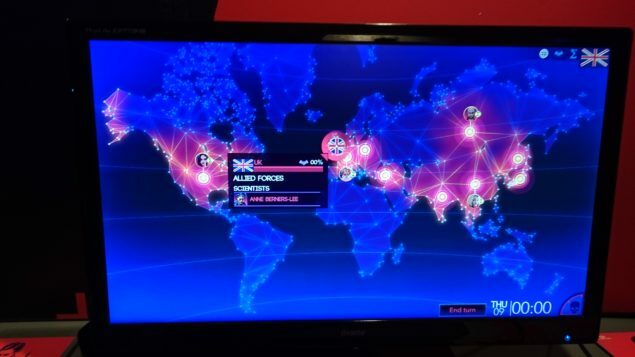 We took our inspiration from many games, X-Com is one of them. W: So how about the storyline? M: Well for now the narrative is not in the game yet. If you’re familiar with some of our previous games like Out There, you’ll know narrative is a very important part of the game for us so although a lot of the basic game mechanics are there, we’re writing the storyline for 50 different agents and their biographies so that when you play with those agents there is a storyline that can unlock depending on what actions you take. If you work with terrorists in some agents will quit as they have a kind of alignment and then it becomes a part of the game to win them back to your cause. Additionally you can have relationships with your agents. There will be 50 agents and 10 countries which the game focuses on. The tech tree will also affect the storyline so there are many possible endings as each technology you unlock can have a positive or negative impact on the world so there will be a really big emerging narrative. W: What about the meta game? M: Well resource management is of course an important aspect of games like this. You may decide that you need to pay scientist X a higher salary to work for you but your government may get upset at you for this. Also, the diplomacy aspect is very important. If you have an agent captured by a country, you can negotiate with them to get your agent back or you can send another agent to try to extract them but of course this is likely to affect your diplomacy rating with that country. If your rating drops to zero, you guys are at war and soldiers can get involved in a war with another country. The point is to make for a lot of different end game possibilities and allow for a lot of replayability scope as getting to the end of the game in scenario 1 is likely to have completely different content experienced from finishing it in scenario 2 and of course you can choose your starting country.